SGS TOP RATED. BEST-IN-CLASS STABILITY & DURABILITY: Eureka's gas springs are tested at over 100,000 cycles to ensure durability. Our advanced manufacturing technology and Z-structure design ensure the desk's extreme stability and durability even when fully extended. No tipping, bouncing, wobbling or tilting guaranteed. Holds up to 35 pounds. EFFORTLESS AND VIRTUALLY SILENT:Eureka's industry-leading, patented lifting and locking mechanism lets you quietly and effortlessly adjust your sit-stand desktop from seated to standing position. No cranking, no clicking. MAXIMUM PRODUCTIVITY AT MINIMAL FOOTPRINT:Eureka's spacious two-tiered design with wide keyboard/mouse tray efficiently accommodates two monitors, your laptop or keyboard, monitor arms, and accessories. INFINITE HEIGHT ADJUSTMENTS:The Eureka Ergonomic Sit-Stand Desktop's patented gas strut mechanism lets you find the exact height level for the correct posture and perfect ergonomic fit. 30 DAY RISK FREE GUARANTEE & NO ASSEMBLY REQUIRED:Ready to use right out of the box. No assembly required. Just open the box, set the unit on your desk and you're ready to go! Eureka! You've discovered the most ergonomically advanced sit-stand desktop technology in the world today. 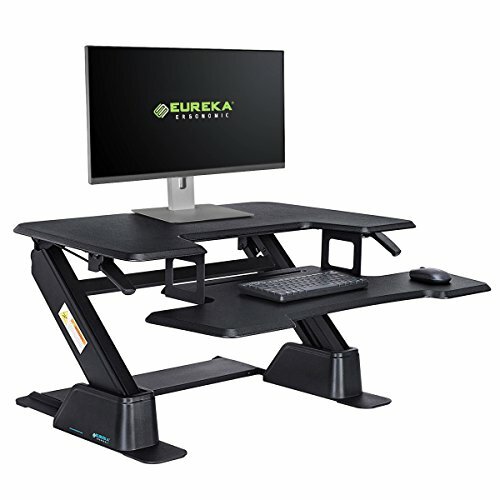 Eureka's advanced ergonomic design creates the optimum interface of technology and humanity. All our sit-stand desktops are designed to maximize the comfort, workability and productivity of the user. Eureka's patented gas strut mechanism provides unrivalled height adjustment flexibility for each and every user. Unlike other sit-stand desks that are limited to pre-set positions, the Eureka lets you find the perfect height level for your perfect posture. Eureka's innovative engineering delivers unequalled ease of use. Our desk tops come fully assembled and ready to go to work. Our patented adjusting and locking mechanism provides a smooth and virtually silent lift without cranking or clicking, for effortless and minimal interruption. Eureka's state-of-the-art robotic manufacturing process ensures the unsurpassed quality and durability of all our products. Our products consistently score the highest possible satisfaction ratings among competitive brands in independent testing. Eureka guarantees your total satisfaction. If you're not satisfied with the Eureka desk-top, for any reason, we offer a 100% money back guarantee and will even pay for your shipping costs. That's how sure we are you'll love it.